If sore throat is severe, persists for more than 2 days, is accompanied or followed by fever, headache, rash, swelling, nausea, or vomiting, consult a doctor promptly. These may be serious. Do not use in children under 6 years of age unless directed by a doctor. cough persists for more than 1 week, tends to recur, or is accompanied by fever, rash or persistent headache. These could be signs of a serious condition. adults and children 6 years and older: dissolve 3 drops (one at a time) slowly in the mouth. Repeat every 2 hours as needed or as directed by a doctor. All Ricola products are lactose and nut free. If you have a specific allergy question please consult your doctor. For further information on our products please visit our frequently asked questions. 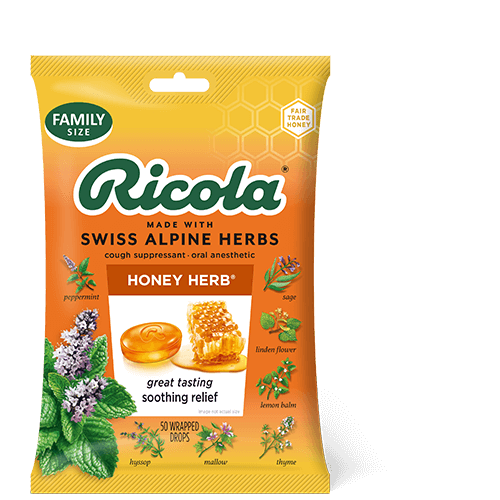 Ricola Honey Herb takes the unique flavor of our classic drop and softens it with real golden honey. Providing a taste your whole family will be buzzing about. 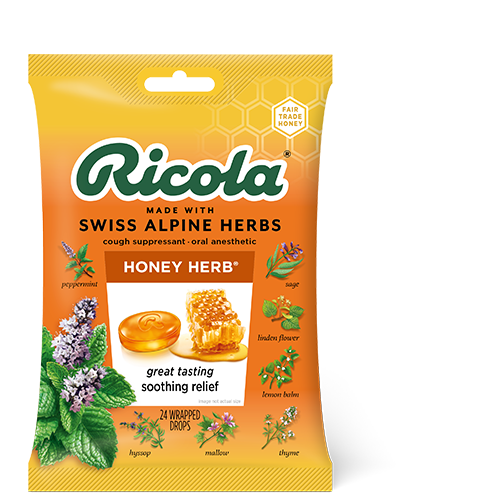 Ricola Honey Herb can be used for soothing relief of coughs and sore throats. And always contains our unique blend of mountain grown Swiss herbs. From that first tickle in the back of your throat to a bad cough that ends up in your chest, Ricola is there to support you along each step of having a cold. Using the goodness of nature to stand by your side from beginning to end.